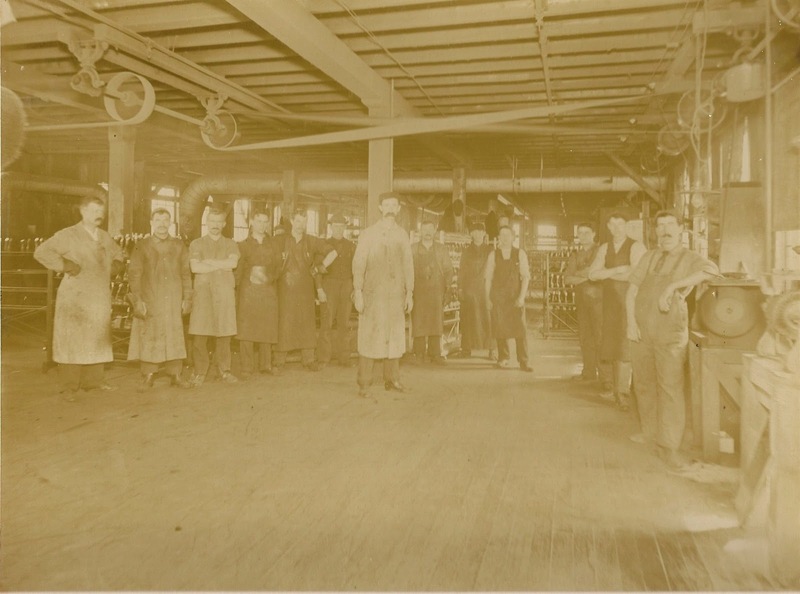 The following is a series of images of the interior of the Hathaway, Soule & Harrington factory on Cambridge Street which I acquired a number of years ago. They had once belonged to George M. Barden, Jr., great-grandson of Andrew Alden who had served as superintendent of the Middleborough factory. The sepia-toned images all measure 8 ¼ inches by 6 inches and are pasted onto sturdy oversized cardboard backings. 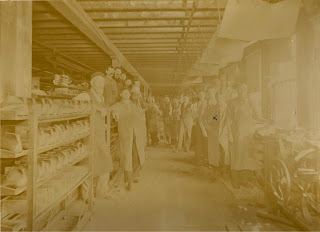 One, depicting the operatives in the packing room, has previously been posted. Unfortunately, the photographs are not marked, save for the identification of Alden and Shuman family members with whom the Bardens were connected. No notations have been made regarding the people captured in the photographs, nor of the work being conducted. Most have faded and have a washed out appearance. Nonetheless, the series constitutes an important visual record of shoe manufacturing in Middleborough and the people engaged in it. 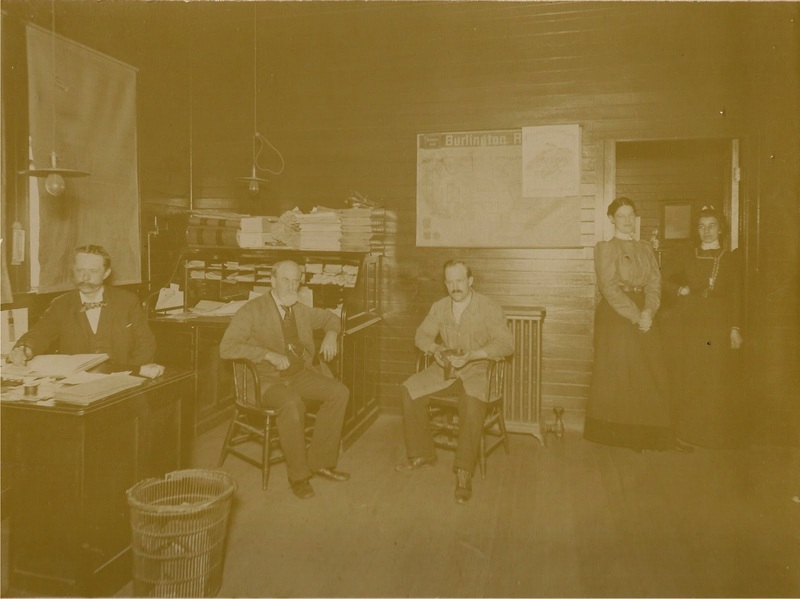 Pictured is the management and office staff of the Hathaway, Soule & Harrington plant at Middleborough in the late 1890s. 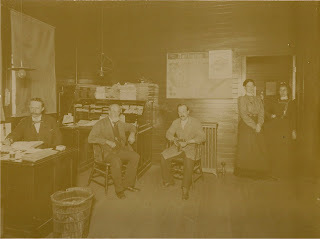 From left to right are clerk William H. Wilde, superintendent Andrew Alden, assistant superintendent Arthur H. Alden, bookkeeper Sadie Ryder, and Alice Roberts. The office embodies a no-nonsense business approach with the bare minimum requirements. Wilde in his role as clerk is neatly-dressed, though both Aldens wear protective overgarments in order to keep their clothes clean while on the factory floor. 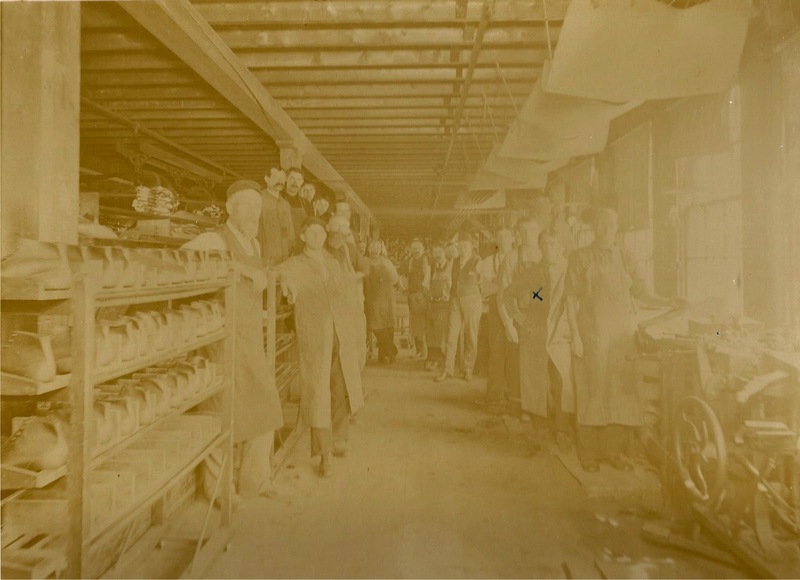 A large freight map on the wall indicates the extent of the Middleborough plant's business. Andrew Alden had initially learned the shoe trade at North Middleborough where he made shoes by hand on Plymouth Street. In 1881, he was instrumental in the formation of Alden, Leonard & Hammond which relocated to Cambridge Street in Middleborough in 1886. Following the acquisition of Alden, Leonard & Hammond's interests in 1887 by Hathaway, Soule & Harrington, Alden remained with the latter firm as superintendent. He retired in 1900 when Hathaway, Soule & Harrington closed the Middleborough branch. Alden's son, Arthur Harris Alden, had entered the shoe trade following his graduation from the Pratt Free School, and he joined his father at Hathaway, Soule & Harrington where he acted as foreman and later assistant superintendent. In 1900, he became the senior partner in Alden, Walker & Wilde which was established that year. William H. Wilde served as clerk of the Hathaway, Soule & Harrington Middleborough operation before joining Alden and George W. Walker in the formation of Alden, Walker & Wilde. 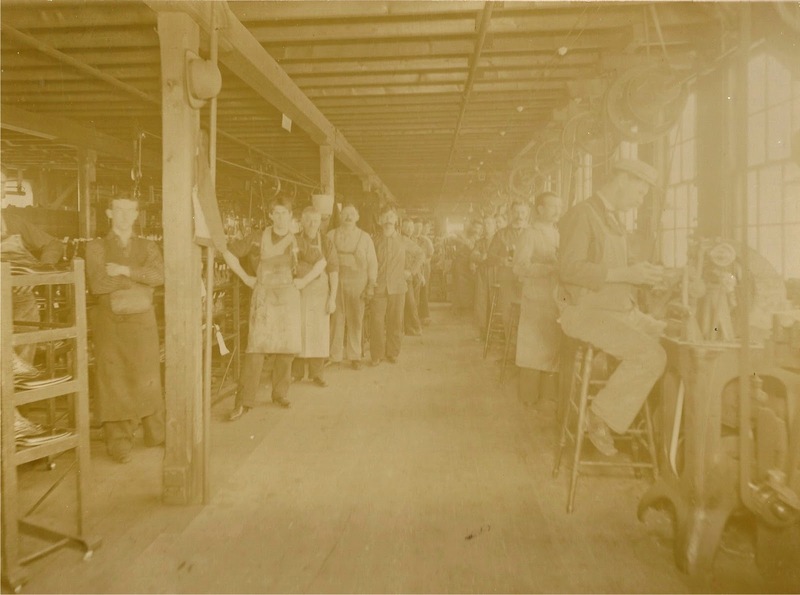 One of the first steps in manufacturing shoes was the cutting of the leather. Leather was procured by experienced buyers in Boston which, thanks to the numerous shoe manufactories operating throughout New England, was the world's largest leather market at the time. Cutters required both great strength and dexterity and were skilled at maximizing the number of uppers which could be cut from each piece of leather. By this time, cutters specialized in the cutting of uppers and the cutting of soles. 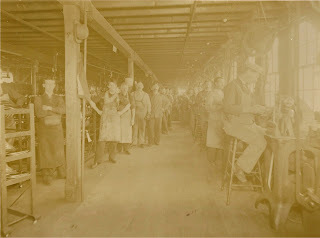 The worker marked with an "x" in the photograph is August P. Johnson. 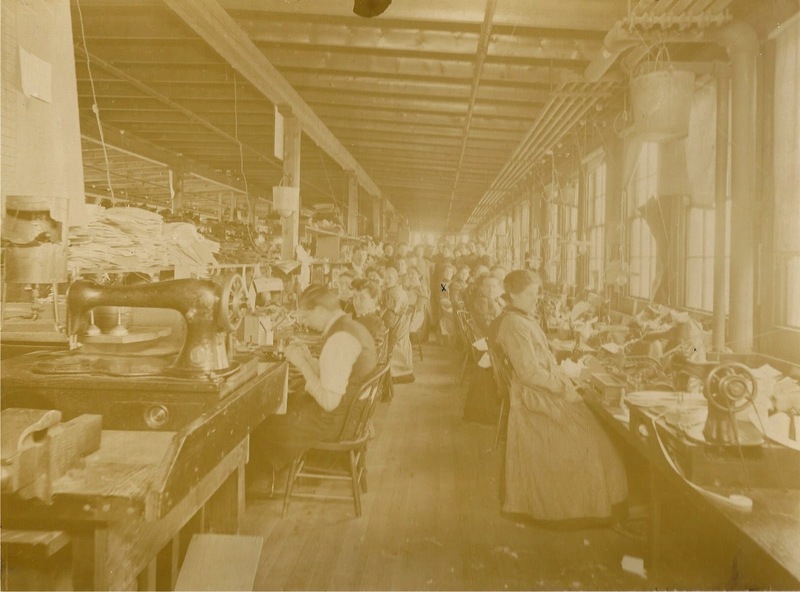 The son of Swedish immigrant parents, Johnson worked as a cutter in the local shoe industry for a number of years. Born in December, 1872, Johnson was about 25 when the photograph was taken. In 1898, he married Mary F. Shuman. 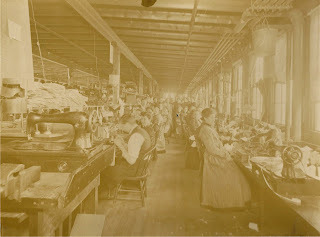 This view likely depicts the stitching room. Once the uppers were cut, they were lined and stitched together. Much of this work was performed by women. 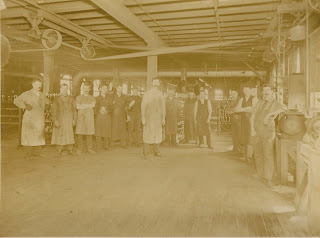 The gentleman standing to the right and marked by an "x" is James Gardner Alden, the eldest son of Andrew Alden. Although records fail to indicate his position in the firm, it is likely that he was employed as a department foreman. 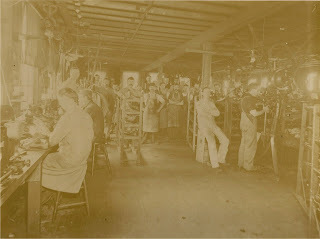 Possibly another view of the stitching room. Carrie Shuman who is seated at the far end of the room is marked by an "x". 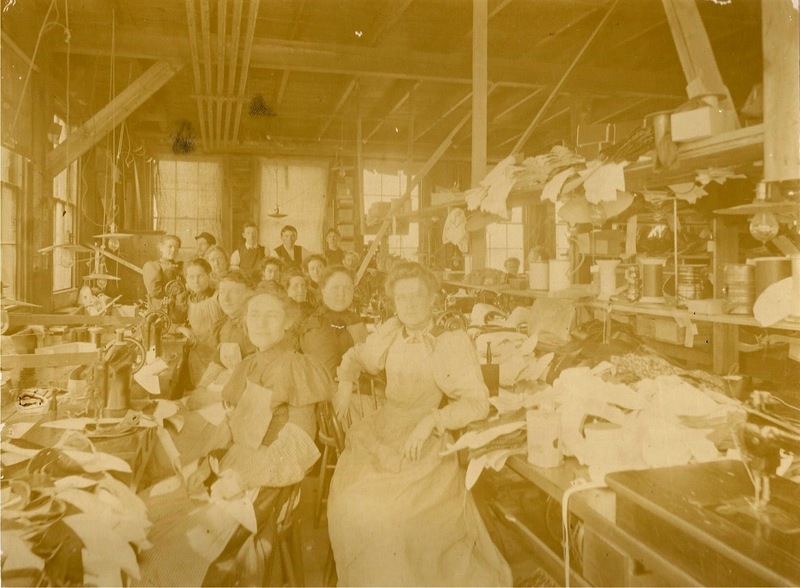 She was one of several operatives who went to work at Alden, Walker & Wilde when Hathaway, Soule & Harrington closed its Middleborough plant. Sanborn fire insurance maps of the era indicate that part of the plant's fire protection included "pails throughout" and a number of these galvanized buckets may be seen hanging near the ceiling. Although the visible clutter in the room raises doubts about the plant's concern for fire safety, the building was in fact equipped with fire escapes on either end of the structure, one of the earliest Middleborough manufactories with this provision. 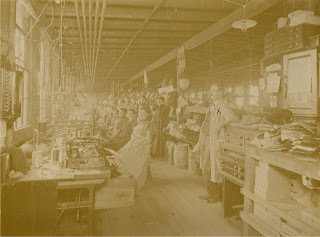 Yet another view of the stitching room. Unstitched uppers appear in the lower left corner of the photograph. The fabric pieces are apparently linings which would have been attached to the uppers during this stage of the work. Note that the women not only wear aprons to protect their clothing, but protective oversleeves as well. This view is possibly of the lasting room. Once the uppers were stitched, wooden lasts were inserted to facilitate the process of bottoming, that is the addition of the soles. 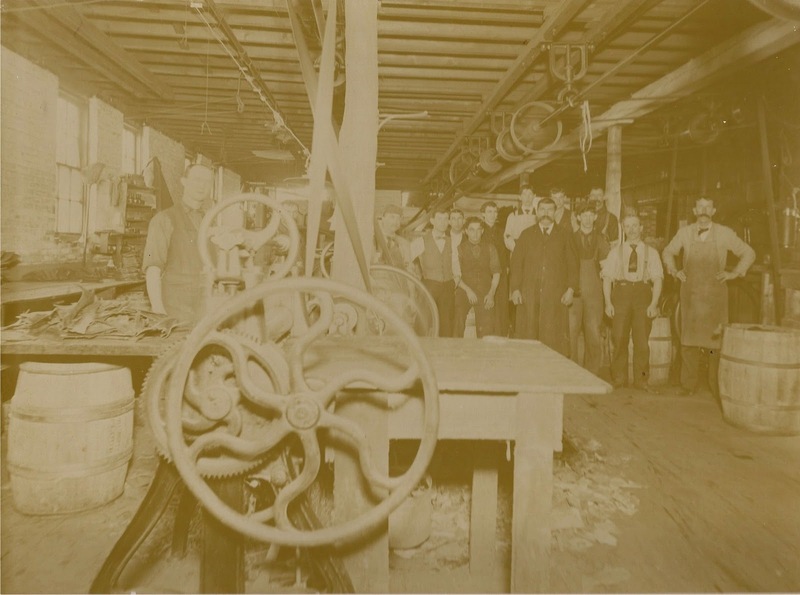 Machines produced by the McKay Company helped revolutionize the process of stitching uppers to soles. 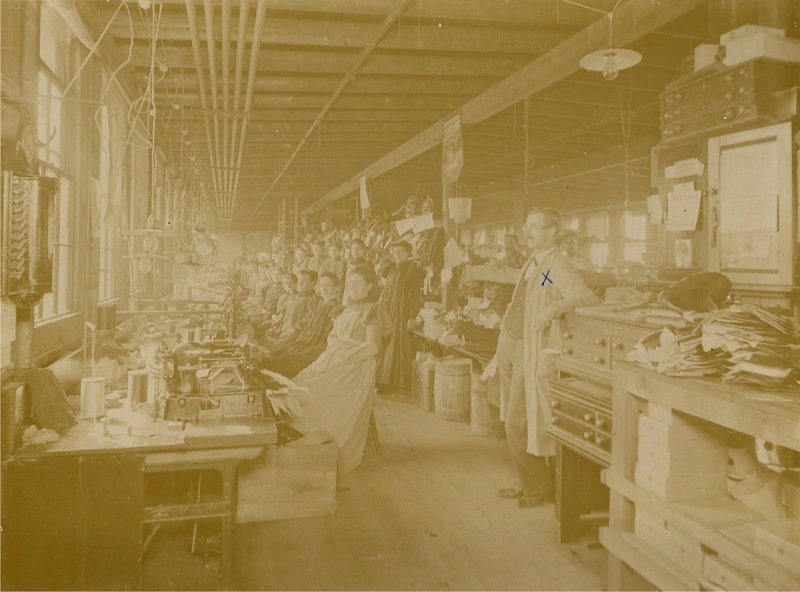 Like his brother Arthur, Frederic Lawton Alden joined the family in manufacturing shoes shortly after his graduation from school. The younger Alden appears towards the center of the photograph marked by an "x". The mechanized nature of the shoe manufacturing process is indicated in this photograph by the belts and shafting over the heads of the workers. 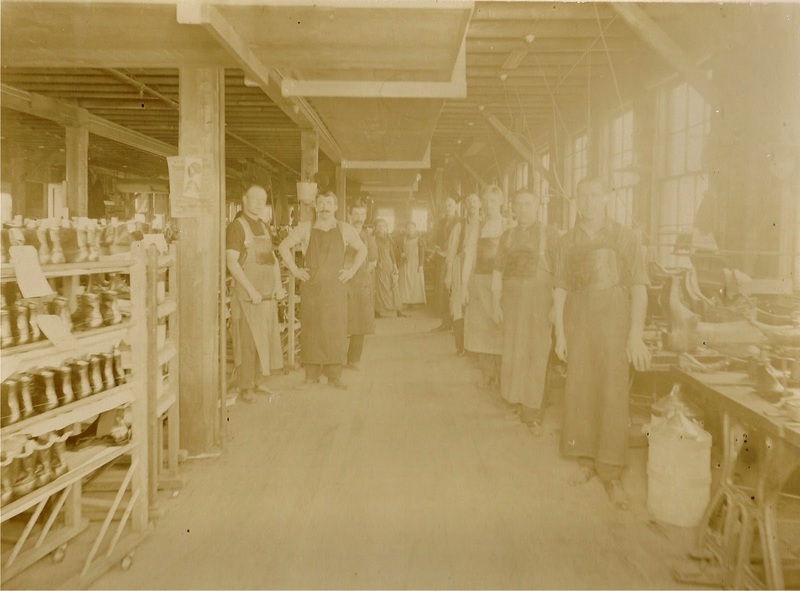 While new machines greatly facilitated the production of shoes, they could prove hazardous to workers. 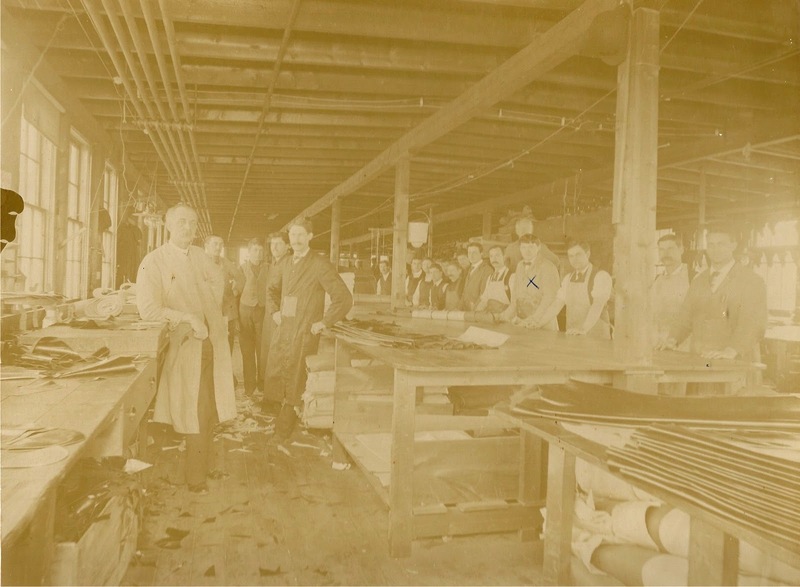 In July, 1888, "a man named Farrington, of Middleboro, employed at Hathaway, Soule & Harrington's shoe factory, cut off a thumb a few days ago in some of the machinery. Lysander Richmond also cut his hand severely on the same day in the same shop." [Old Colony Memorial, "County and Elsewhere", July 19, 1888, p. 4].